The province of Quebec announced through a new bill that it plans to eliminate outstanding applications for Quebec Skilled Worker Program. The applications submitted prior to August 2, 2018 will be eliminated. 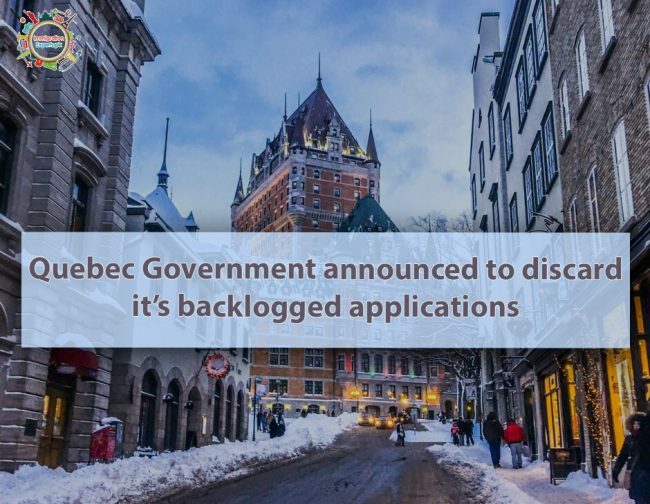 This means that around 18,000 applications submitted before this date, and those are yet to be approved, refused or rejected, will be cleared from the current backlog of Quebec Skilled Worker Program (QSWP), and the government processing fee will be refunded. Discarding off backlog of is one of numerous proposals under new immigration bill tabled by Quebec’s new Coalition Avenir Quebec Government on Thursday, February 7. The proposal also includes introductory changes to Quebec Immigration Act that emphasizes an immigrant’s “responsibility” to learn Quebec values and French. The goal of bringing about the changes is to ensure that immigrants to Quebec are better integrated and therefore better equipped to succeed in Quebec labour market. The Minister observed that the backlogged applications were submitted when the QSWP operated on a first-come, first-served basis, and which he said did not cater the needs of Quebec’s workforce. This approach was no longer viable when Quebec shifted the application process to more merit focused Expression of Interest model in August 2018. How the new system operates? In the new system, foreign workers register an online profile with Quebec’s Immigration Ministry (MIDI) that mentions their education, training, work experience and language abilities. MIDI then select applicants to apply for a Quebec’s Selection Certificate based on a variety of considerations, including labour needs in outlying regions of the province which are experiencing profound shortages of workers.